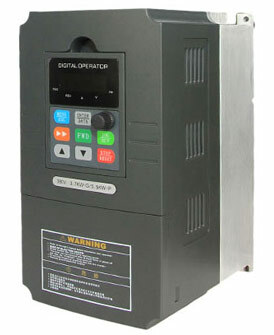 Why VFD driven motor is hot? * The voltage waveform created by the variable frequency drive (VFD) has high frequency harmonics that will cause an increase of temperature inside the motor. If your VFD-PWM has no filter outputs and the cable connection VFD-Motor is long, you can easily get a premature insulation failure. * What were the load variations? If the motor was installed in a system that required many and quick speed or binary changes in short periods, you will stress the motor, and extra ventilation conditions or right output protections should be taken in account. * If your VFD-PWM had the motor working below 25 or 30 Hz for long periods, without an extra ventilation system you will have motor overheating due the fact that the motor's fan is not enough to cool the electric windings. * How old was the motor? The old class B insulation types are totally not advised to work with VFD. Class F insulation types (more recent motors) are better, but you should read the manual carefully or ask the motor/VFD supplier what you must take in account. There are insulation materials that can be applied to increase protection of the electric windings against overheating caused by VFD. * What were the environmental conditions of the local? If you have a dusty and non-clean space, the ventilation conditions will get reduced over time and fan cooling will also get reduced. If you have a space with typical high temperatures, check the possibility of install an efficient ventilation system in the area. * An extra: Is the motor located close to the ocean or can be affected by corrosive agents? Salt. for example, can be a very nasty agent and it will easily attack insulation wirings if you do not have them tropicalized. If your motor is located close to the ocean and sometimes stops for a few minutes/hours and does not have heating winding resistances, salt will attack windings insulation. However it is very uncommon a short-circuit of all phases in this situation. * It is always better to read first the manual of the VFDs and check what could have compromised the motor. Better to avoid than to correct. Excess motor's overheating should have been avoided by thermal protection. Did you have any thermal protections in the system? 250 KW 3 PHASE INDUCTION MOTOR 440VOLT , 742 RPM , SIEMENS MAKE IE2, F CLASS INSULATION RUN ON SIEMNS VFD , LOAD ON MOTOR IS ABOVE 85% , AND MOTOR IS HEATING , TEMP GETTING CLOSE TO 115 DEGREE ..... NEED SOLUTION ?